Economy, speed and comfort were his top priorities, which is why he opted for a Dickey Boat partnered with the new VW TDI diesel. The performance figures recorded on our test day speak for themselves, and McNicholas tells me that he wouldn’t change anything about his boat – herein lies the beauty of buying a custom-made package. 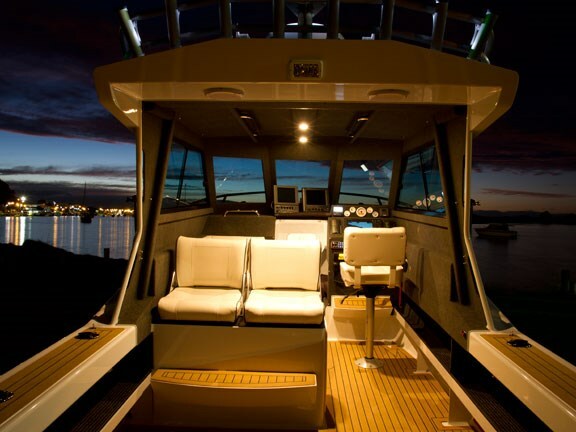 Once you climb on board via the stylish boarding ladder, you’re greeted with an abundance of Tek Dek synthetic teak, precisely laid anywhere that you might need to step. To limit the intrusion of the engine bay into the cockpit, it has been cleverly moved back onto the duckboard and doubles as a seat. Access to the spacious cockpit is available through twin removable doors on either side. McNicholas loves his fishing and his personally-designed bait board is certainly impressive. 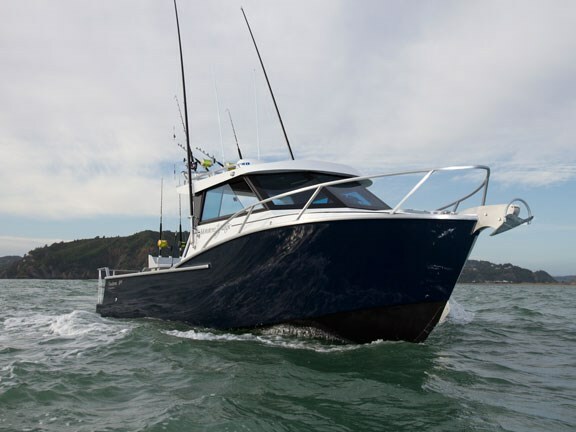 All bases are covered with twin tuna tubes in the gunnels, a live-bait tank, 21 precisely-positioned rod holders, game poles, a self-draining cockpit and a saltwater wash-down pump, keeping the vessel looking magic at all times. An insane Furuno electronics system (including a chartplotter, depth sounder, sonar, radar, autopilot and tow camera) dominates the dash, without encroaching too much on available space. The sonar installation required some serious design work to accommodate and, as expected, Dickey and his team have done an excellent job in concealing its presence. Seating underneath the hardtop has been arranged to create a social atmosphere. The rear seat backs pivot to allow a view forward to chat, or out back to keep an eye on the lures. The seats dish out plenty of "aaah" factor and footrests are provided for everyone, whichever way they're sitting. Handrails are in good supply, although McNicholas’ mates have asked for a couple more due to his "life is short" driving style. It's for those same mates, who turn green around the gills, that a toilet and comfortable full-length upholstered squabs have been included in the cabin. McNicholas was kind enough to invite myself and Dickey out for a day’s gamefishing, chasing Marlin out of Whakatane. Dickey's wife and business partner, Tristin, had packed us a tasty lunch and we really couldn’t have struck a better day to put the Dickey Custom 800 to the test, with a 1m northerly swell running combined with a 20 knot westerly, adding some short sharp chop to the mix. Once out past Whale Island, heading for the trenches, the messy beam-on swell did it's best to smash us off course. But thanks to the innovative hull design and abundance of torque from the quiet VW TDI, McNicholas was able to kick back in the helm seat and let the autopilot easily guide the way at 28 knots! The plumb bow came into it's own, holding a rock-solid course as if we were on rails, and I was blown away by the wall of water that was being effortlessly sliced and diverted down the side of the hull, with very little ending up in the cockpit. After trolling lures all day for a few skippies, the washing machine-like conditions had eased and Lance entrusted me to take the helm for a bit of a play. To say I was impressed with the sporty performance, silky ride and meagre fuel usage is an understatement. While conditions didn't allow us to engage full throttle on the day, figures from the initial sea trial suggest this magic vessel is capable of 36 knots at WOT (4200 rpm). 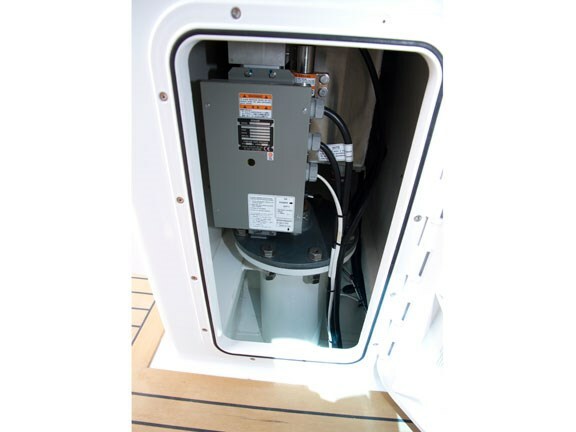 Dickey Boats manufactures its own classy range of high-quality alloy trailers, fitted with rubber skids to provide a more secure resting place. On arrival back at Whakatane, we were greeted with a brisk outgoing tide running horizontally across the ramp and very little space to manoeuvre. Visions of bent props, red faces and gouged paintwork came to mind, but McNicholas easily drove eight metres of boat straight onto the trailer without a hitch. At three-tonne dry she’s a serious towing proposition but partnered with a suitable tow vehicle, the possibilities are endless. 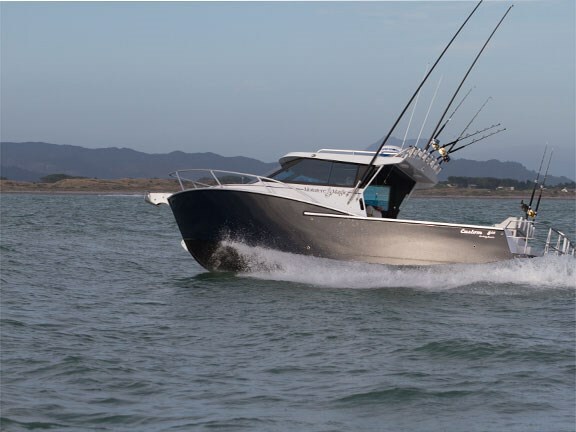 The team at Dickey Boats have certainly done themselves proud yet again; Motutere Magic is enchantingly stunning, with an outstanding layout and superb finish to match. But that's not what floored me the most: the silky smooth and assured ride was pure magic. But don't just take my word for it, try one of Dickey Boat's hull designs for yourself. Just make sure you pick a day that's going to cause this hull to break a sweat..